The minimum number of guest rooms required to be accessible in transient lodging facilities is covered by section 224 of the 2010 ADA Standards. 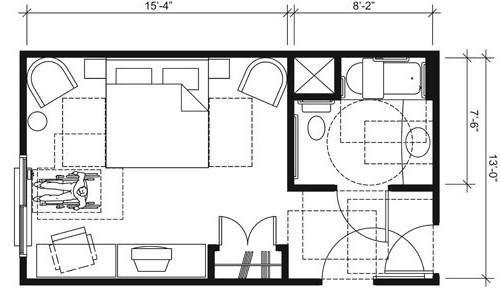 Scoping requirements for guest rooms with mobility features and guest rooms with communication features are addressed at section 224.2 and section 224.4, respectively. Accessible guest rooms are used not only by individuals using mobility devices such as wheelchairs and scooters, but also by individuals with other mobility disabilities including persons who use walkers, crutches, or canes. 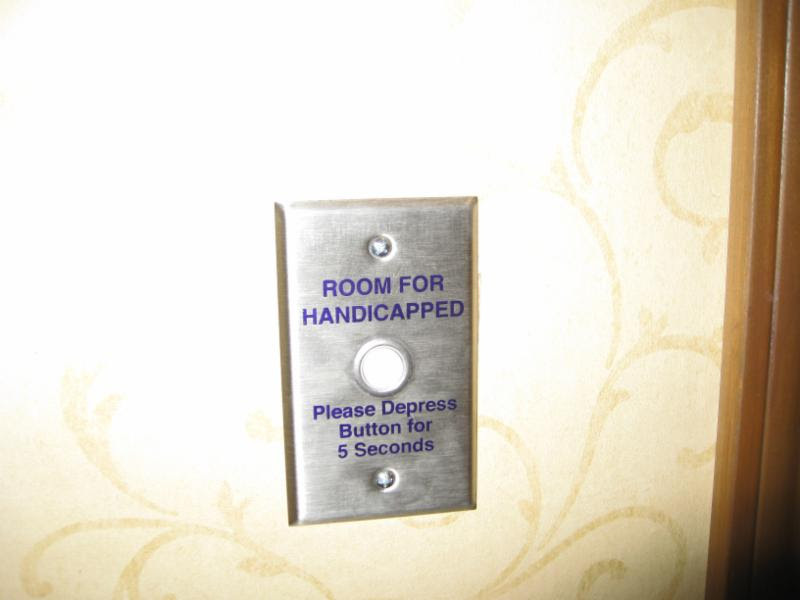 Guest rooms with communication features are used by persons that are visually and hearing impaired. Even knowing where to look does not always make it simple to understand the requirements. This newsletter will give you some examples of the not so well known rules about Transient lodging. #ADAFact: If there are less than 51 guest rooms in a hotel or dorm, you are required to have mobility rooms without roll in showers. This rule is very easy to miss because most of hotels have more than 50 guest rooms. If you have less than 50, there are zero roll-in showers required. 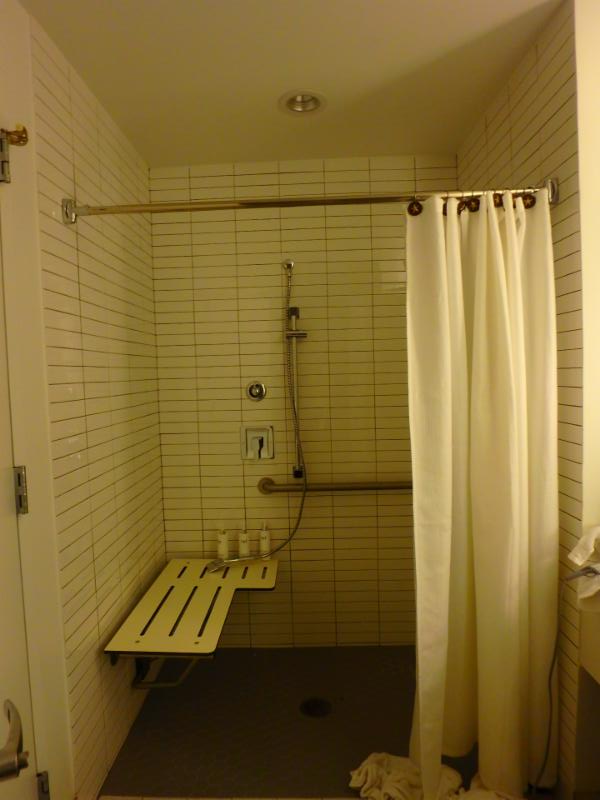 But there are still required accessible bathing fixtures. In a recent hotel review, I performed there were exactly fifty guest rooms. 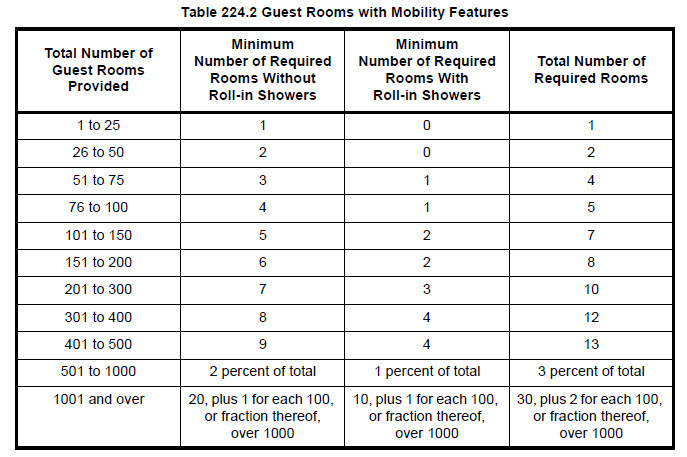 I looked at the chart to see how many rooms with mobility features were required and saw that it was two. But what I also noticed was that both of them could not have a roll in shower. As a matter of fact, there is always a minimum number that is required without roll in showers. So they could provide tubs or transfer showers instead. See the chart below. 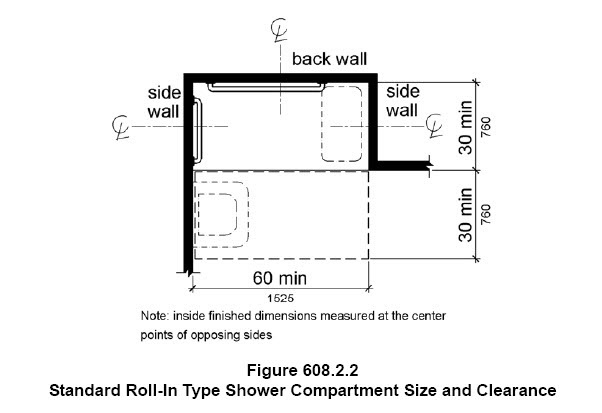 If they are interested in providing a roll in shower as an option, they would have to add a third guest room with mobility features. 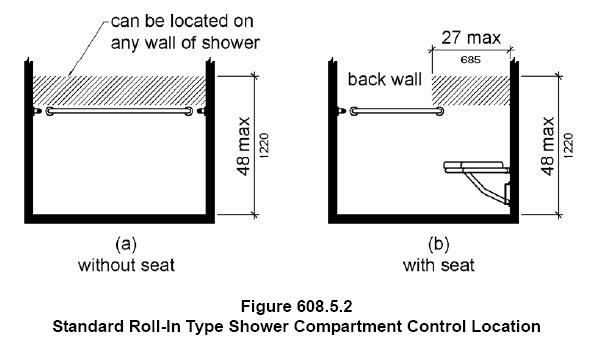 #ADAFact: All showers in a “transient lodging” facility are required to have a wall or floor mounted folding seat. #ADAFact: At least one guest room (but no more than 10%) required to provide mobility features as described in the 2010 ADA shall also provide communication features. That means that you can’t have all your guest rooms with communication features in the mobility rooms. But you are required to provide at least one of the rooms with both communication and mobility features. 224.5 Dispersion. Guest rooms required to provide mobility features complying with 806.2 and guest rooms required to provide communication features complying with 806.3 shall be dispersed among the various classes of guest rooms, and shall provide choices of types of guest rooms, number of beds, and other amenities comparable to the choices provided to other guests. Where the minimum number of guest rooms required to comply with 806 is not sufficient to allow for complete dispersion, guest rooms shall be dispersed in the following priority: guest room type, number of beds, and amenities. 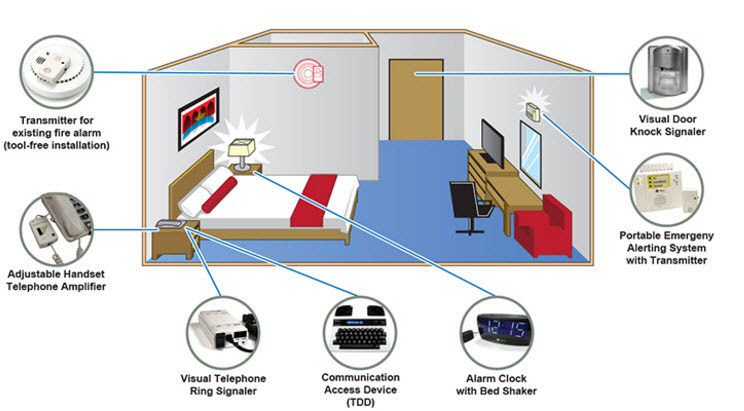 At least one guest room required to provide mobility features complying with 806.2 shall also provide communication features complying with 806.3. Not more than 10 percent of guest rooms required to provide mobility features complying with 806.2 shall be used to satisfy the minimum number of guest rooms required to provide communication features complying with 806.3. In the 1991 ADAAG this was not the case and some establishments made all the rooms with communication features the same as the rooms with mobility features. Communication features must be available as soon as the guest arrives. It is no longer allowed to have a device at the front desk for the guest’s to request. this is a hard-wired notification device for the hearing impaired. There typically is more communication rooms required than mobility rooms, and therefore some would be exclusively rooms with communication features. Designers must be careful to make sure that they are providing 90% of the rooms with communication features without mobility features.